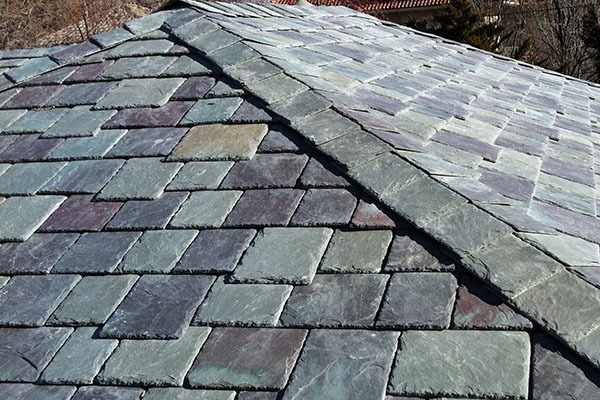 Slate is one of the oldest yet most beautiful roofing materials known to man. Slate rock originates from sedimentary particles of clay and silt. Roofing Slate is a dense, durable, natural occurring material that is essentially non-absorbent. The color of slate is determined by its chemical and mineral composition. Because these factors differ in various regions, roofing slate can be obtained in a variety of colors. The most common thickness used for roofing slate is 3/16” to 1/4”. Because of the relatively high cost of slate, the Chicagoland market for this material has decreased. A roofing square of slate (100 sq. ft.) set at the standard 3-inch head lap will vary in weight from 650lbs. to 8,000 lbs. depending on the thickness of each roofing slate. Slate varies significantly in weight because of the numerous thicknesses and types available from the different quarries. When the weight of felt, nails, and standard 3/16” slate is added, the dead load of slate roofing is approximately 800 pounds per square. NRCA recommends slate roofing be applied over continuous or closely spaced wood decking. When plywood is used, NRCA recommends the use of a minimum 5/8 thick nominal exterior-grade plywood. Oriented strand board (OSB): NRCA is concerned with potential fastener-holding problems and dimensional stability because of the effects of moisture where OSB and other non-veneer products are used as roof decking. Preservative-treated wood: Many roofing material manufacturers recommend wood roof decks be constructed with wood that has been treated with a nonoil preservative pressure treatment or with non-treated air- or kiln-dried lumber. Underlayment (or “felt paper” as it is frequently called) is installed over the roof deck before the application of slate. An underlayment performs two primary functions: it provides temporary weather protection until the slate is installed, and it provides a secondary weatherproofing barrier if moisture infiltrates the slate roof covering. Many Chicagoland slate roofs have outlived the underlayment felts over which they were installed. Therefore, an underlayment’s service life should be comparable to the design service life of the slate roof covering. Asphalt saturated, non-perforated organic felts are among the most common underlayments; they commonly are designated as Type 15 and Type 30 or referred to as No. 15 and No. 30, which are reflective of a once used pound per square weight designation. The terms Type I and Type II now are used within the industry in lieu of No. 15 or No. 30, respectively. Another type of roofing underlayment is a synthetic underlayment. It is characterized as being lightweight, water-resistant and less likely to wrinkle; having high tear strength; and being easy to walk on—even when wet. Theoretically, the product may be left exposed to the elements for extended periods of time. Although synthetic roofing underlayments and their purported attributes seem appealing, there are significant issues to consider before using them. To date, there are no applicable ASTM standards for these products. Many synthetic roofing underlayments do not meet current building code requirements, so manufacturers need to obtain a code evaluation report for code compliance. NRCA recommends a minimum of one layer of No. 30 asphalt-saturated felt applied horizontally in shingle fashion on roof decks having a slope of 8:12 (34 degrees) or more. Where weather conditions are severe and hard wind-driven rains are common, NRCA recommends a minimum of two layers of No. 30 asphalt-saturated felt applied horizontally in shingle fashion. For roof slopes of 4:12 (18 degrees) to 8:12 (34 degrees), a minimum of two layers of No. 30 asphalt-saturated felt are recommended as long as standard-size slate with 3-inch minimum head-lap is used. NRCA does not recommend installing slate roof systems on roof slopes less than 4:12 (18 degrees). In the Chicagoland area, where the average temperature for January is 30º F or less, NRCA suggests installation of an ice-dam protection membrane. An ice-dam protection membrane generally is a self-adhering polymer-modified bitumen membrane. An ice dam protection membrane should be applied starting at a roof’s eaves and extending upslope a minimum of 24 inches from the exterior wall line of a building. For slopes less than 4:12 (18 degrees), a minimum of 36 inches is recommended.